We would like to thank…. Our architect Greg Blee (www.bleehalligan.co.uk) asked whether we wanted to be entered into the RIBA (Royal Institute of British Architects) East 2018 awards earlier in the year. We thought ‘why not?’ and then didn’t give it much thought. We were surprised and excited to find out that we had been shortlisted in March and the judges came round to visit in April. As we had already committed to go on holiday (a rare event!) 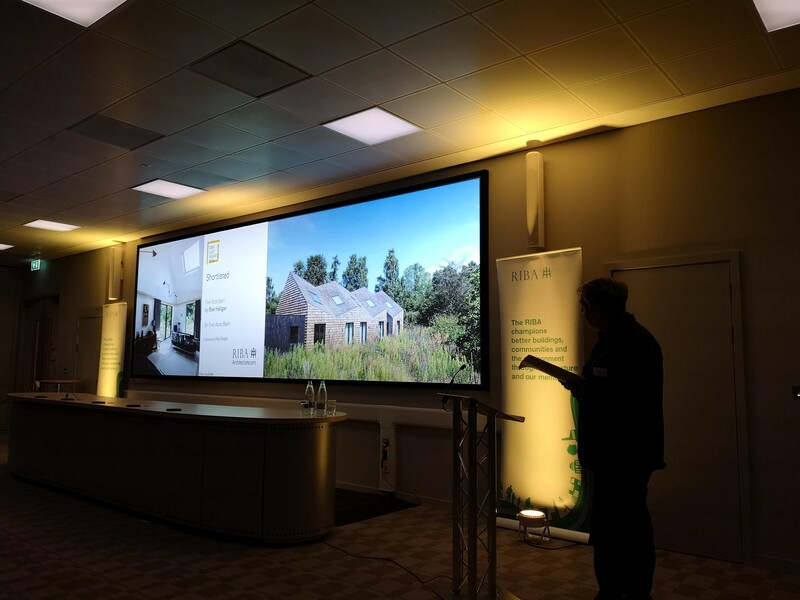 we could only guess from the snippets of feedback we received from Greg and our B&B sitting friend James, whether or not Five Acre Barn had impressed the judges…..
Bruce and I then went off – with some trepidation – to the awards ceremony on 24th May just outside Cambridge. 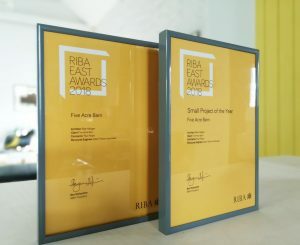 The long and the short of it was that we were an award winner and also received an additional gong for ‘Best small project’ (not that it felt very small to us, but it is in relation to university libraries, social housing estates etc.). It was a very interesting event and a rare chance for people like us to hear about the incredible projects being undertaken in the area. Each shortlisted project was featured and the judges provided insight about how the project had been conceived and executed. Unfortunately we missed most of the feedback from the judges about our own build as we were busy gurning for the cameras with our awards – but we were really pleased that as well as celebrating the great work of Greg and Josh, our architects, they also acknowledged the excellence of our builder Paul Rolph. We have come to realise that builders are frequently the ‘unsung heroes’ and it was great to see him get some well deserved credit! The awards are currently in the loo in the Barn – isn’t that what you are supposed to do with them?? We will contact Adele for some advice….